The choice between visiting stores and buying through the internet is not a mutually exclusive one. Asian retailers are finding new ways to smooth the shopper experience through technology and this is one of the most exciting features of the FMCG market in the region. In China, the world’s largest eCommerce market, the fusion of offline and online (OAO) is a priority for every major retailer – and that includes those who have built their businesses online. The founder of Alibaba, Jack Ma, has spoken about the inevitable merging of these offline and online shopping experiences. And China’s leading regional retailers are already demonstrating the positive impact that technology can have on the shopper journey. Digital innovation in shopping is in no way restricted to China, though. The roles that different Asian retailers are finding for technology reflect the different business models that they have adopted, and the particular priorities of their shoppers. In some cases, low smartphone and internet penetration means that different forms of digital shopping are less of a priority. PX Mart in China Taiwan (where eCommerce represents 6% of FMCG growth) and 99 Speedmart in Malaysia (where eCommerce’s FMCG share is below 5%) are yet to launch digital shopping services for their customers. In China, Wumart and Yonghui are both leveraging their existing networks of brick and mortar stores to deliver fresh food to customers ordering via the retailers’ branded apps. Using stores as bases for delivering allows them to guarantee delivery within hours – and often within 30 minutes. Ordering online isn’t the only role played by Wumart’s Dmall app. The technology is also used to speed shoppers’ journeys through the in-store environment, where it can be used to scan barcodes and pay instantly through integration with mobile payments services. Shaochuan Xu.,Executive Director and Chief Operating Officer of Wumart, China, said:'We want to build seamless integration between “offine and online. We introduced Dmall APP two years ago, and between 40% and 50% of our customers are now using it. Dmall links a customer’s loyalty card to their personal ID and to payment tools like Alipay and Wechat. We’ve developed a ‘Freedom Buy’ functionality that allows customers to scan the barcodes of the products they buy. When they pass an exit they can scan a QR code to bring up all the products they’ve bought and pay instantly. VIP customers can then leave the store immediately without anyone checking their basket. We’ve worked to develop frictionless payment services and, for transactions under 500RMB, there’s no need even to type in a passcode. The fusion of online and online isn’t restricted to delivering smoother customer experiences or providing new ways to buy. 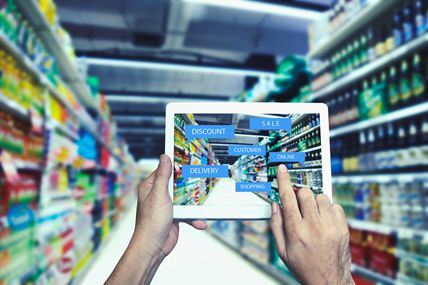 Digital innovation in the supply chain also has a critical role to play in optimising supply chains and ensuring the right product and merchandising mix is in place at each store. China’s Wumart chain has developed a digital management system to tailor product mix to the customer profile of different stores. In Thailand, 7-Eleven uses its online shopping service to extend the potential of its limited shelf space, making unproven new products available through its eCommerce channels initially, and making space for them in-store once their appeal to shoppers has been demonstrated.